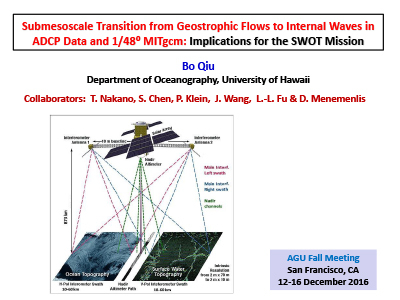 Qiu, B., Nakano, T., Chen, S., Klein, P., Wang, J., Fu, L-L., and Menemenlis, D. (13-Dec-16). 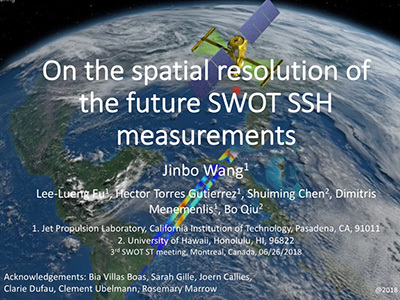 With the use of Ka-band radar interferometry, the SWOT satellite will improve the measured sea surface height resolution down to the spectral wavelength of 15km, allowing us to investigate for the first time the upper ocean circulation variability at the submesoscale range on the global scale. 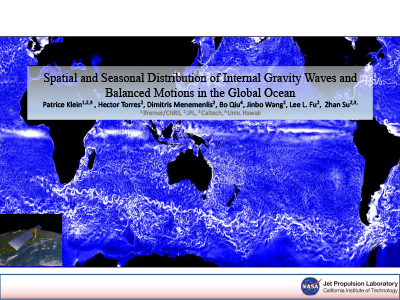 By analyzing repeat shipboard Acoustic Doppler Current Profiler measurements along 137°E, as well as the 1/48-deg MITgcm simulation output, in the northwest Pacific, we demonstrate that the observed/modeled upper ocean velocities are comprised of balanced geostrophic motions and unbalanced ageostrophic wave motions. 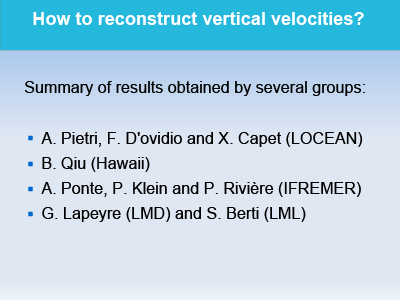 Qiu, B., Chen, S., Klein, P., Wang, J., Torres, H., Fu, L-L., and Menemenlis, D. (2018). 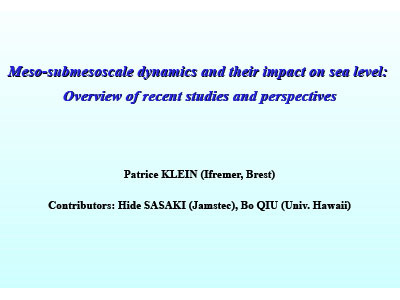 Seasonality in Transition Scale from Balanced to Unbalanced Motions in the World Ocean, J. Phys. 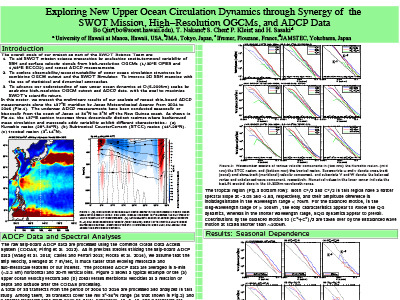 Oceanogr., 48, 591-605. doi:10.1175/JPO-D-17-0169.1. 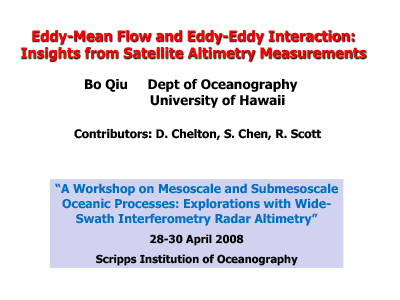 Wang, J., Fu, L-L., Qiu, B., Menemenlis, D., Farrar, T.J., Chao, Y., Thompson, A.F., and Flexas, M.M. (2018). 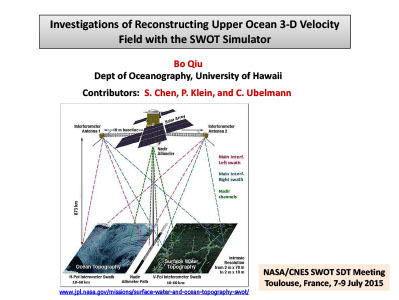 An Observing System Simulation Experiment for the Calibration and Validation of the Surface Water and Ocean Topography Sea Surface Height Measurement Using In-Situ Platforms, J. Atmos. Ocean. 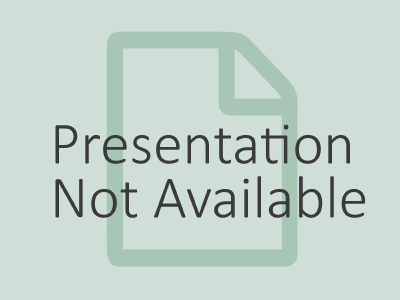 Tech., doi: 10.1175/JTECH-D-17-0076.1. 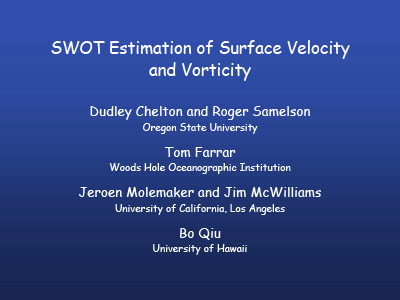 Sasaki, H., Klein, P., Sasi, Y., and Qiu, B. (2017). 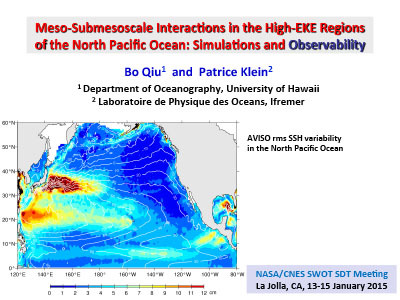 Regionality and Seasonality of Submesoscale and Mesoscale Turbulence in the North Pacific Ocean, Ocean Dyn., 67, 1195-1216. 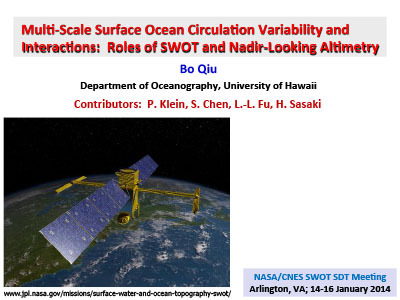 Qiu, B., Nakano, T., Chen, S., and Klein, P. (2017). 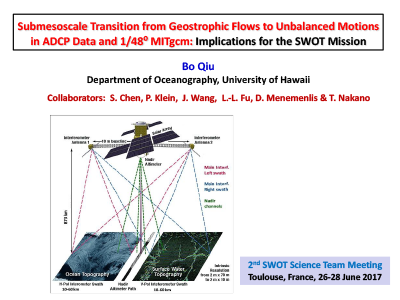 Submesoscale Transition from Geostrophic Flows to Internal Waves in the Northwestern Pacific Upper Ocean, Nature Commun., 8(14055), doi: 10.1038/ncomms14055. 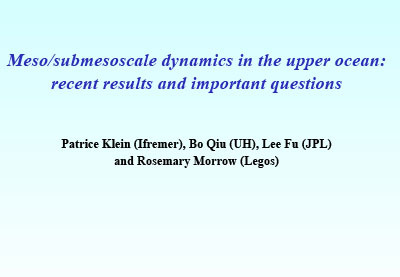 Qiu, B., Chen, S., Klein, P., Ubelmann, C., Fu, L-L., and Sasaki, H. (2016). 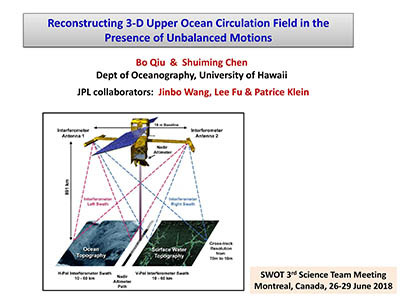 Reconstructability of Three-dimensional Upper-ocean Circulation from SWOT Sea Surface Height Measurements, J. Phys. 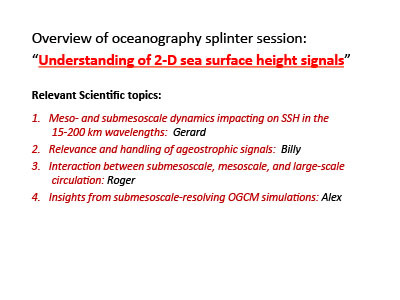 Oceanogr., 46, 947- 963, doi: 10.1175/JPO-D-15-0188.1. 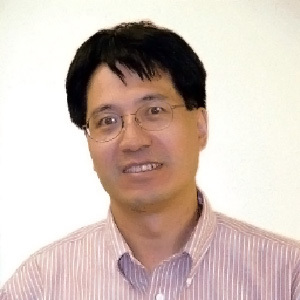 PI: Bo Qiu (16-Jun-17). 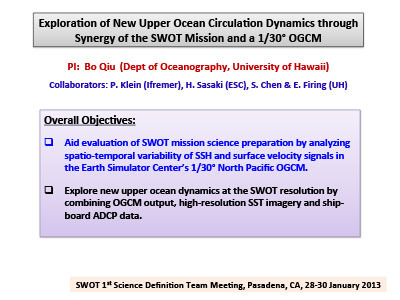 The overall goals of our project as part of the SWOT Science Team are, (1) to aid SWOT mission science preparation by evaluating spatio-temporal variability of SSH and surface velocity signals from available repeat ship-board ADCP measurements and high-resolution OGCM output from 1/48° MITgcm (llc 4320), and, (2) to advance our understanding of new upper ocean dynamics at O(5-200km) scales by analyzing high-resolution OGCM output and ADCP data, with the goal to maximize SWOT's scientific return.